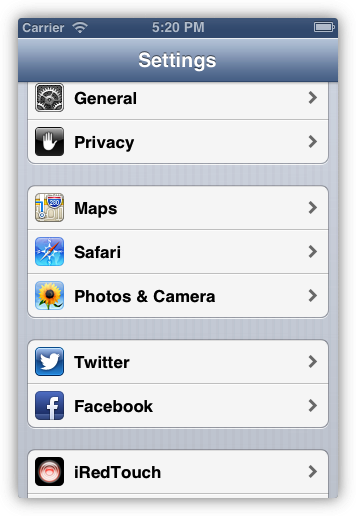 iRedTouch HD V1.3 brings a lot of new features which where requested by my users. VPN! 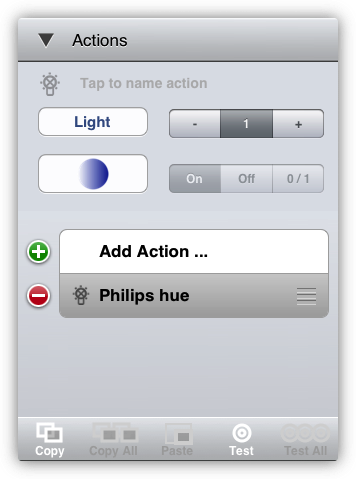 You can now control your equipmemnt at home via mobile networks! It requires some work, though. 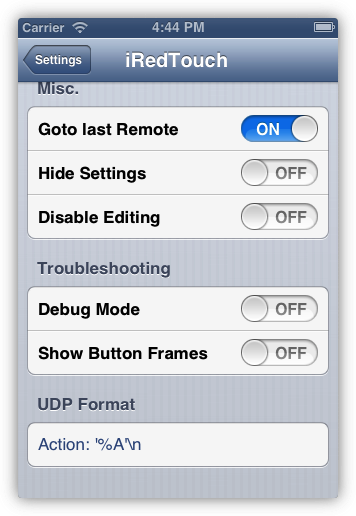 UDP: due to special request you can send configurable (!) 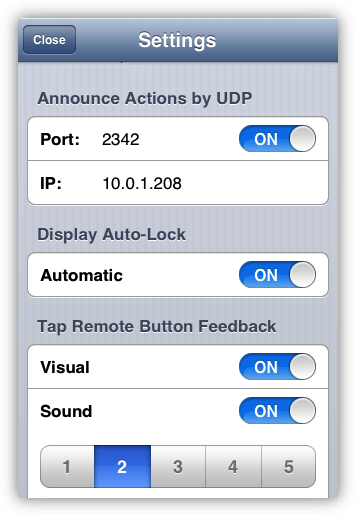 notifications by UDP, whenever iRedTouch performs an action. Here comes some screenshots and a little bit explanation on each topic. At the top you'll find the main controls again, then a row with 7 different buttons switching the kind of action. 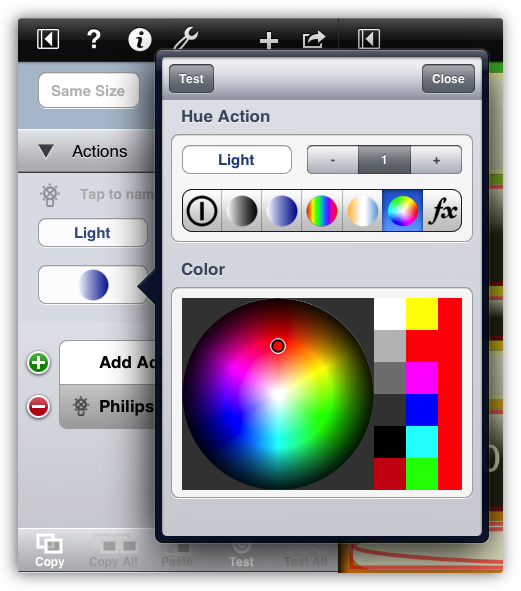 Here the color button is selected and you can choose the color from some predefined ones or move your finger on the color wheel. Please note that the hue lights will not show exactly these colors. Just try some using the Test button at the top. Color temperature (2000K .. 6500K), the default is 2710K. 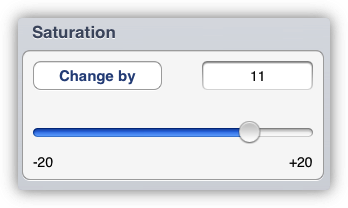 If you rather want to change the saturation incrementally, tap the Set to button which changes to Change by. That's it, your HUE is configured. 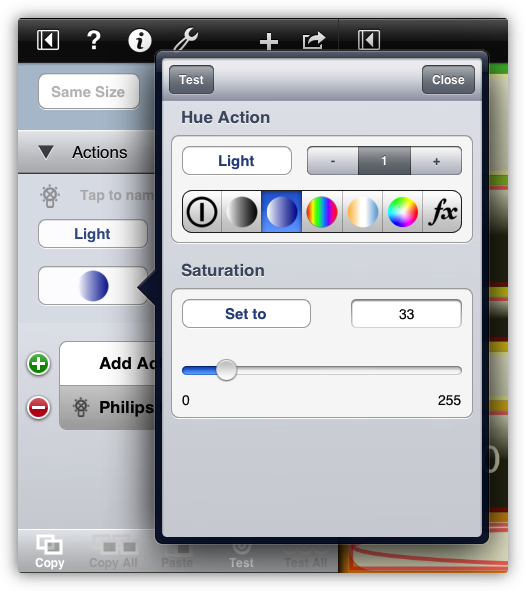 For your convenience you'll find a new remote in the Templates section with several HUE actions already configured. For every action you can also choose to show a track info for the currently playing song. 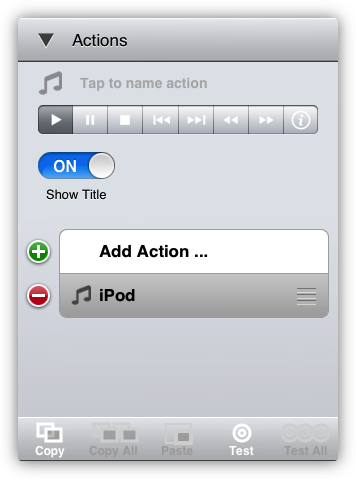 For your convenience you'll find a new remote in the Templates section with all iPod controls set up. 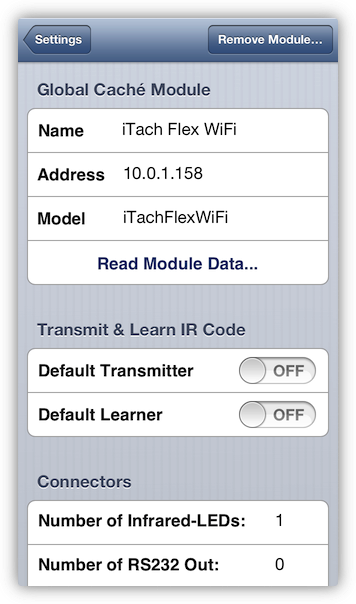 Finally you can control your IR and other equipment at home while you're on the road by mobile networks. This is done via VPN, Virtual Private Network. Due to security restrictions the setup of a VPN is not an easy task. In general you have to configure your router at home, set several passwords and usernames, acquire a DNS name for your home router, .... I'm sorry, but I really can't support you on that. The iTach Flex is a new small and very versatile piece of hardware by Global Cachè. It comes as LAN and WiFi based models and has always an IR learner built-in. By using connector cables you can add (multi) IR blaster, serial out (RS232) or contact closure (relay). I must admit, I don't make use of this feature, but some people do, and they are happy that they can now set the UDP format to their needs.